Join us at noon on Monday, March 6 in the Fishbowl to hear poet Raina J. León. Raina J. León, member of the Carolina African American Writers Collective, has been published in numerous journals as a writer of poetry, fiction and nonfiction. Her first collection of poetry, Canticle of Idols, was a finalist for both the Cave Canem First Book Poetry Prize (2005) and the Andrés Montoya Poetry Prize (2006). Her second book, Boogeyman Dawn (2013, Salmon Poetry), was a finalist for the Naomi Long Madgett Prize (2010). Her third book, sombra: dis(locate), was published in 2016. 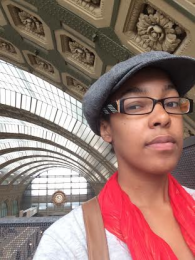 She has received fellowships and residencies with Cave Canem, CantoMundo, Montana Artists Refuge, the Macdowell Colony, Kimmel Harding Nelson Center for the Arts, Vermont Studio Center, the Tyrone Guthrie Center in Annamaghkerrig, Ireland and Ragdale. She also is a founding editor of The Acentos Review, an online quarterly, international journal devoted to the promotion and publication of Latin@ arts. She is an Associate Professor of Education at Saint Mary’s College of California. This reading is co-sponsored by CRGS and the Library.